humanâ&#x20AC;&#x2122;s incapability to negotiate complexities that occur in real-time, which necessitates immediate responses. Through this new imagined sensory, it will enable the emergence of new forms of landscape, which was not possible without the machineâ&#x20AC;&#x2122;s new dimensions of sentience. Rejection of the dichotomous image created by ‘the manmade’ and ‘the idealized’ untouched image of Nature was brought on by technological advancements humans developed for modifying all known Natures. Such production brings upon an anxiety as to what was once natural. Through our ability to create and conceptualize hybrids of biotic and abiotic systems, we have also facilitated the evolution and image of novel ecologies. Furthermore, design is consistently introduced to “tame” newly-ostracized biologic systems to human will. To legitimize uncanny creations, humans find and extract any economic and practical capacities. However, despite levels of human control, there is always a moment in which a system will fail. autonomous, human-value reinforcing machine because, as individuals, we have lost touch with our ability to negotiate the complexities of our relationships with non-human actors throughout all of earthâ&#x20AC;&#x2122;s landscapes. -northern Minnesota to Pilottown, Louisianna (Gulf of Mexico) -The Mississippi River is a meandering beast that receives 41% of the US’ watershed downstream to the Gulf of Mexico. In 1802, the US Army Corps of Engineers established to re-engineer the river by creating minimal interventions, such as removing snags, closing off secondary channels, and excavating rocks and sandbars. The upper part of the Mississippi River has 29 locks and dams, including narrowing a channel to 9’ for barge traffic. Such diversions have affected the river’s course, producing a river that is both “natural” and manmade. Re-envisioning Harold Fisk’s temporal meandering map of the Mississippi, I’ve re-diagrammed Fisk’s map with the addition of the years post 1944 to further reveal the meandering movement of the river. fig. 03.1-1 temporal + morphological diagram of the Mississippi River from the mid 1800â&#x20AC;&#x2122;s to the present. project benefits existing commercial fisheries by enhancing marsh conditions, and improving the fish and wildlife resources of the area. Such project along the Mississippi has affected the ecosystem, creating new species that are classified as â&#x20AC;&#x153;exotic.â&#x20AC;? US Army Corps of Engineers Pilotown, Louisianna (Gulf of Mexico) 1942The Wax Lake Delta is a river delta in Louisianna that was formed by rapid deposition of sediment following the creation of a canal through Wax Lake off of the Atchafalaya River in 1942. It is located roughly 20 miles (32 km) southwest of Morgan City adjacent to the Atchafalaya delta. It receives 34 million tons of sediment per year. In the 64 years between 1941 and 2005, Wax Lake was completely filled with sediment, and the delta prograded approximately 8 kilometers into the sea. US Army Corps of Engineers Alameda, California 1912As Alameda island became settled, buildable land became a demand. Through the filling of the mudflats, Alameda grew in size, most significantly with the commission of the military to be used as a naval air station. However, being situated in the Bay Area, the synthetic filling of the island is what could potentially cause its own demise due to earthquake, which in turn could cause liquefaction. Marcel Stive South Holland, The Netherlands 2011 The Sand Engine is an experiment in the management of dynamic coastline. It is a scandbarshaped peninsula created by man; the surface is about 1 square-kilometers. It is expected that this sand is then moved over the years by the action of waves, wind and currents along the coast. To protect the West of the Netherlands, against the sea, the beaches along the coast are artificially replenished every five years, and it is expected that the san engine will make replenishment along the Delfland Coast unnecessary for the next 20 years. This method is expected to be more cost-effective and also helps nature by reducing the repreated disruption caused by dredging and replenishment. THE LIVING + Scape New York, NY 2011 Confluence is a collaborative project produced by THE LIVING and Scape. Confluence used sensors underwater similarly to THE LIVINGâ&#x20AC;&#x2122;s previous project, Mussel Choir. The elucidation of the aquatic life happening below the surface is the design objective to be used as an educational method. The location of these species are then projected onto the surface where the people can interact with the digital representation of marine life. California College of the Arts, Architecture Studio Jeff Maeshiro, Jia Wu, Mary Sek; under the instructions of Jason Johnson and Michael Shiloh San Francisco, California 2013 Geoweaver is a robotic machine that prints geometric modules on the landscape based ont he variability of the slope of the surface it is traversing. However, the robotic device does not sense the evironment in which is in existence to produce its prints. The intended geometric patterns are affected by the slope and texture of the surface it is printed on. Richard Simon, “Garcetti Lobbies US for more expensive LA River Project,” (LA: LA Times, May 26, 2014), http://www.latimes.com/local/la-me-dc-rivergarcetti-20140527-story.html. California Invasive Species Advisory Committee, The California Invasive Species List, (Sacramento: Invasive Species Council of California, 2010), p. 9. The following mappings and diagrams were produced in the initial analysis f the proposed site. The temporal mappings of the river, revealed the extents of the once-shifting watershed of LA River prior to its channelization and concretization in 1938 by the US Army Corps of Engineers. The once-existing ecology of the LA River began to decline, yet produced new ecologies that are considered to be â&#x20AC;&#x2DC;novel,â&#x20AC;&#x2122; by conservative ecologists. Mayor Eric Garcettiâ&#x20AC;&#x2122;s plan to revitalize 2.3 miles of the river in DTLA will potentially produce 9.8 million cubic feet of concrete, as well as open the river to sedimentation processes. This is about 5% of the volume of the concrete that lines the total length of the 51-mile river from Calabasas all the way down to Long Beach, which is 208 million cubic feet of concrete. Through the understanding of the soil types studied in the previous chapter, one can deduce the types of planting that proliferate and thrive in specific zones based on their prefered conditions. Using the similar method in analyzing the different types of soils, the same graphic chart were used in charting each of the plants’ ideal slope, salt tolerance, soil density, pH tolerance, nutrient requirement, and viscosity tolerance. These are respective to the same metrics as the soils, which allows for a method of understanding what type of soil each plant species prefers. In doing so, the overlapping areas become the shared values of both soil and plant. which allows to charge the arid underground landscape of the LA River (at its open condition, being at the water level to capture water); while attuning the fluvial morphology of both water and sediments above (at its open condition, above the water level). Finally, a static condition is closed when the aquifer below is filled. fig. 08-4 LA River - Present rendering of its concretized channel filled with urban runoff. Drawing by Leif Estrada. fig. 08-5 LA River - Historic rendering, pre-channelization, preconcretization. Drawing by Leif Estrada. fig. 08-6 LA River - Historic rendering, pre-channelization, preconcretization, overflow scenario, which caused infrastructural damage. Drawing by Leif Estrada. fig. 08-7 LA River - Projective rendering. Modulated perception by the translation of the Natural realm of reality into the realm of the virtual through sensing and actuated response. Drawing by Leif Estrada. fig. 08-8 Attuner, imagined as real-time responsive injection piles charging existing and new aquifers seen from below the water table as a swaziometric perspective.. Drawing by Leif Estrada. v fig. 08-10 Attuner, injection piles detail shown in multiple conditions. Drawing by Leif Estrada. fig. 08-11 Attuner, live sentient model situated in the geomorphology table during the thesis defense. Photograph by Robert Tangstrom. fig. 08-12 Attuner, live sentient model situated in the geomorphology table during the thesis defense. Photograph by Robert Tangstrom. fig. 08-13 temporal scans of the Kinect motion sensor, which produces a point-cloud and is then translated to become a mesh, and finally as surfaces. This was 3D-printed in order to visualize the 3D sensory of the Kinect, which reads surfaces differently than our anthropogenic sensories. fig. 08-14 temporal sectional model showing the transformative change that occurs due to accretion and erosion. The frosted part of the each sectional sliver is emblematic of a deviceâ&#x20AC;&#x2122;s limitation when scanning the landscape. This is constantly faced when translating the concept into realization. fig. 09.1-3 Nataly Gategno and Jason Kelly Johnson, founding Principals of Future Cities Lab, Leifâ&#x20AC;&#x2122;s former professors at CCA. Sedimentation: process of material deposition and accretion through the transportation of flows, (sp. : water) Virtual: a conceptual notion, which refers to the Environment that is yet to present itself in the realm of the being (visibility and tangibility); however exists invisibly yet affects the landscape *note that theoretical terms are italicized. THEORETICAL Bell, David, and Barbara Kennedy eds.. The Cybercultures Reader. London and New York: Routledge, 2000. Print. Benjamin, Walter. “The Work of Art in the Age of Mechanical Reproduction.” Limited Reprint. London: Penguin Books, 2009. Bonabeau, Eric. Swarm Intelligence: From Natural to Artificial Systems. New York: Oxford University Press, 1999. Print. Bryant, Levi. Onto-Cartography: An Ontology of Machines and Media. Edinburgh: Edinburgh University Press, 2013. Print. Cantrell, Bradley and Justine Holzman. Responsive Landscapes: Strategies for Responsive Technologies in Landscape Architecture. London: Routledge, 2015. Print. Cronon, William. Uncommon Ground : Rethinking the Human Place in Nature. Pbk. ed. New York: W.W. Norton, 1996. Print. Del Tredici, Peter. “Neocreationism and the Illusion of Ecological Restoration” in Harvard Design Magazine 20. Cambridge: Harvard University, 2004, 87-89. Desfor, Gene and Roger Kiel. Nature and the City: Making Environmental Policy in Toronto and Los Angeles. Tucson: University of Arizona Press, 2004. Print. England: Intellect, 1999. Print. Pícon, Antoine. “Anxious Landscapes: From Ruin to Rust” in Gray Room 01. Cambridge: MIT Press, 2000. pp. 63-84. Sanderson, Eric W., and Conservation Society Wildlife. Mannahatta: A Natural History of New York City. New York: Abrams, 2009. Print. Smith, Neil. Uneven Development : Nature, Capital, and the Production of Space. New York, NY: B. Blackwell, 1984. Print. Waldheim, Charles. “Strategies of Indeterminacy in Recent Landscape Practice” in Public 33: Errata. Toronto: Public, 2006, 80-86. SITE Fletcher, David. “Flood Control Freakology: Los Angeles River Watershed” in The Infrastructural City : Networked Ecologies in Los Angeles. Barcelona; New York :Los Angeles] :New York]: Actar; The Los Angeles Forum for Architecture and Urban Design ;The Network Architecture Lab, Graduate School of Architecture, Planning and Preservation, Columbia University, 2008, 36-51. Friends of the LA River. The First State of the Los Angeles River Report. Los Angeles: Friends of the Los Angeles River, 2005. Print. Gumprecht, Blake. The Los Angeles River: Its Life, Death, and Possible Rebirth. Baltimore: Johns Hopkins University Press, 1999. Print. Herbert Alexander, Simon. The Sciences of the Artificial. Cambridge: MIT Press, 1996. Print. Kiel, Roger. Los Angeles: Globalization, Urbanization and Social Struggles. New York: John Wiley and Sons, 1957. Print. Marcus, Laurel. “Watershed Restoration: An Idea Whose Time Has Come—Again” in California WaterfrontAge Spring 1988, Volume 4, No. 2. San Francisco: San Francisco State University, 1988, 13-23. Orsi, Jared. Hazardous Metropolis: Flooding and Urban Ecology in Los Angeles. Berkeley and Los Angeles: University of California Press, 2004. Print. Pearce, Fred. The New Wild: Why Invasive Species will be Nature’s Salvation. Boston: Beacon Press, 2015. Print. Varnelis, Kazys. The Infrastructural City: Networked Ecologies in Los Angeles. Barcelona; New York :Los Angeles] :New York]: Actar; The Los Angeles Forum for Architecture and Urban Design ;The Network Architecture Lab, Graduate School of Architecture, Planning and Preservation, Columbia University, 2008. Print. Prior to entering Harvard University’s Graduate School of Design, Leif had previously proposed a similar thesis project into Yale University’s School of Architecture - MED program. Though, he did not pursue this degree, the very essence of his eventual thesis at Harvard were similar - both in theory and eventual design product. His interest in the theoretical definition of “natural” formed the foundation, which established his thesis. 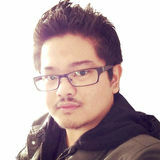 The architectural background he gained previously from CCA, and his interest in making and coding manifested his latent aspirational goal for his research. SPECIAL THANKS TO: my AdvisorsBradley Cantrell: for your continued support of my nerdiness and making this the most fun design thesis! As my Core IV design critic, REAL Lab-Cyborg Ecologies director, Independent Study advisor, Cyborgs professor, and as my Thesis advisor-thank you for pushing me in doing the best that I can as a designer! Neil Brenner: Thank-you for expanding my mind in thinking critically and theoretically of the things that I produce and make, as my program advisor in the MDes department and as our director in the Urban Theory Lab. The many recommended bibliographies truly helped me developed the theoretical framework of my argument... most especially with Latour. my Tech Supports (literally and figuratively)Rob Tangstrom: Thanks for having patience with me while enduring thesis the entire year and sometimes not having time for us to spend together. Also thanks for making those pistons; Iâ&#x20AC;&#x2122;m sorry they didnâ&#x20AC;&#x2122;t make it in the final model! Elise Bluell: Thanks for being my rock this semester and allowing me to vent to you about thesis and life in general-and for that phragmites drawing... shhhh! Spyros Ampanavos and Yujie Hong: The two of you are rockstars! Thank-you for allowing me to constantly bug you whenever I needed you to debug my code... You guys made me wish I did the Technology concentration within MDes! my previous ProfessorsProfessor David Malan: The things that I learned in CS50 were definitely utilized in the development of this project. Thanks for making us, who are uncomfortable, comfortable in learning computer science, and of course to the veritable TF’s of CS50! Jason Johnson and Nataly Gategno of Future Cities Lab: The Sensorium studio at CCA, was not only the most fun studio I’ve ever taken, but really introduced me to coding and tinkering. Having Massimo Banzi, creator of Arduino, visit our studio was truly inspiring! Your practice enabled me to see design outside of the traditional norm of the discipline as something I’ve become so passionate about. Maggie Janik: Thank you for recording my thesis as an example for the GSDâ&#x20AC;&#x2122;s Thesis archive =) A big thanks for editing the video as well! 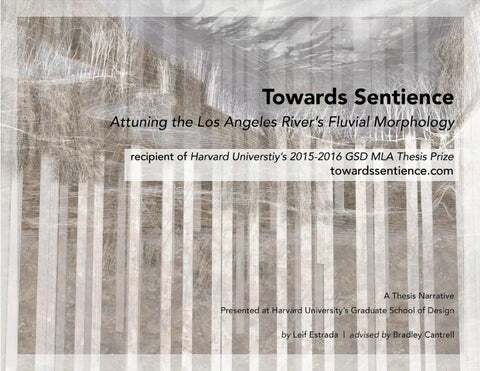 to all those who helped and contributed their knowledgeLane Barden: for allowing me to use your beautiful aerial photographs od the LA River to be a part of my thesis. They, indeed, helped the aesthetics quality of my animated renderings. FoLAR: for conversing with me about the groupâ&#x20AC;&#x2122;s goals in the revitalization efforts of the LA River, and providing me with many important documents that helped me understand the historic and present ecology of the river. US Army Corps of Engineers: for providing me with specific quantifiable data that I used in the development of my thesis.